This original article was created by, and is the exclusive property of Silent Hall of Fame. 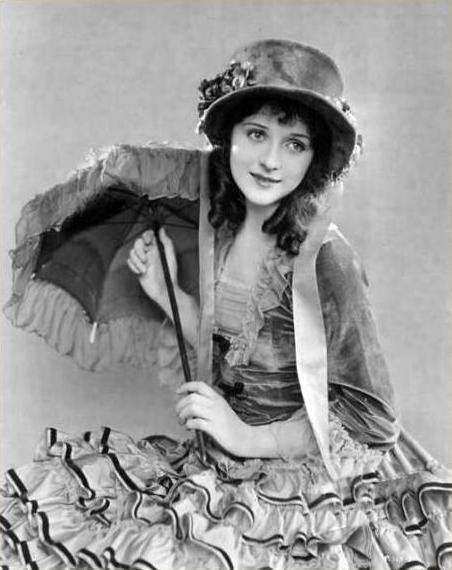 Marceline Day was the younger sister of Alice Day, who was a famous and loved actress in her own merit. Marceline and Alice were very close to one another, and they both had a very close relationship with their mother Irene. 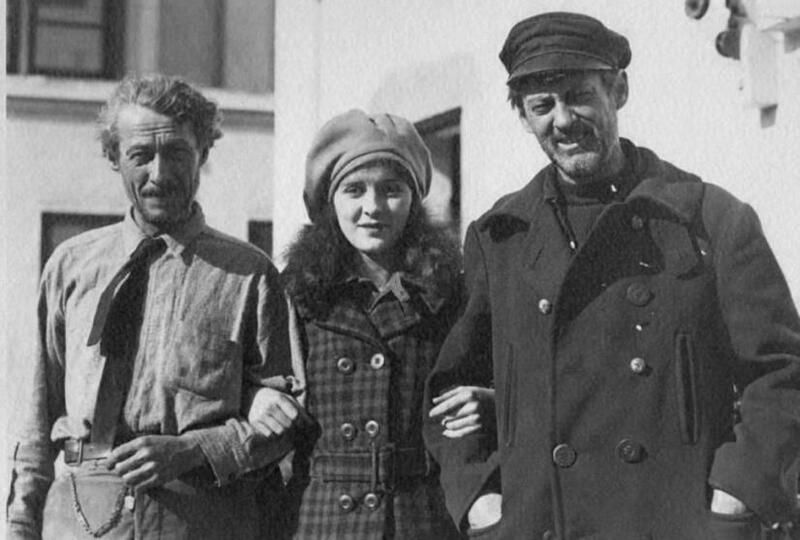 After living in Salt Lake City for a number of years the three of them arrived in Hollywood in early 1923. 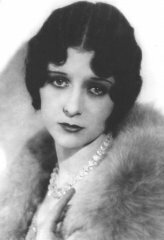 Marceline Day made her first film appearance at 15 years young as an extra in William C. de Mille's film "Only 38", released on 6/17/1923. 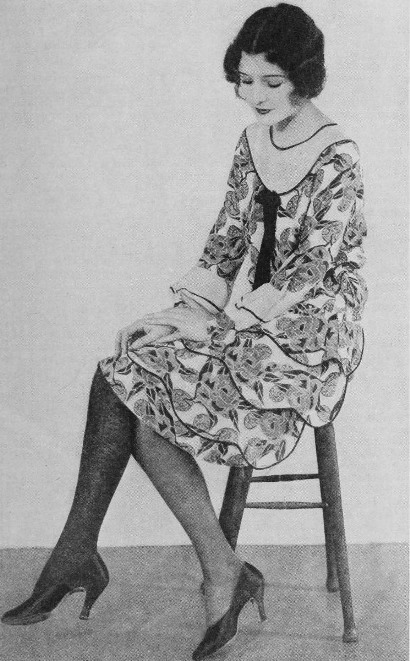 Her first leading role at 16 years young was in the short comedy "Black Oxfords", released on 5/18/1924. Later that year she partnered with Harry Langdon in what critics called "two stellar comedies" - "The Luck o' the Foolish" and "The Hansom Cabman". In early 1925 Marceline Day played her first leading role in a feature film partnering with the star of Westerns Hoot Gibson for "The Taming of the West", and the critics already called her "a promising newcomer to the screen". For her role in "The White Outlaw", released on 9/6/1925, where she co-starred with another luminary of Westerns, Jack Hoxie, critics called Marceline Day's performance "splendid". She was 17 years young. 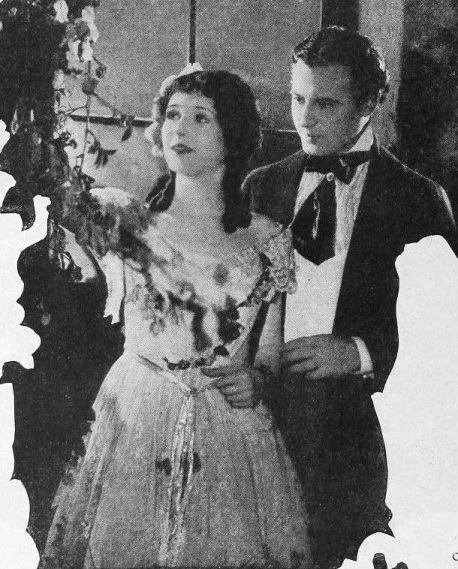 In late 1925 Marceline Day played her first dramatic role in "The Splendid Road", a critically acclaimed film about the California gold rush, for which she "created an outstanding achievement", according to the film's renowned director Frank Lloyd. 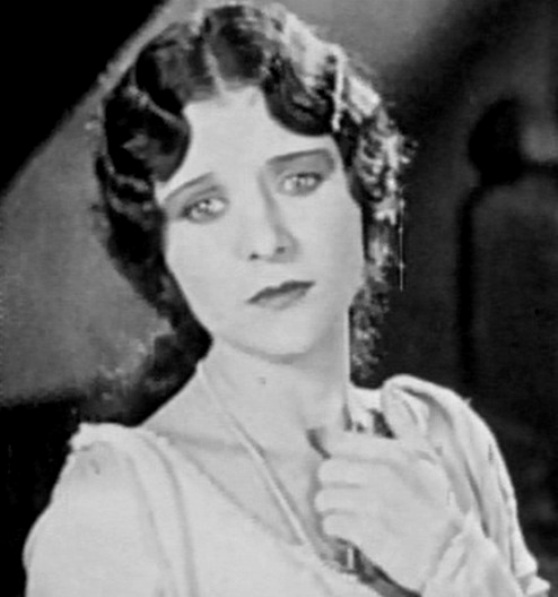 A critic commented that "Marceline Day contributes a splendid dramatic spark. A brilliant future seems destined for her." That brilliant future started becoming reality very soon. 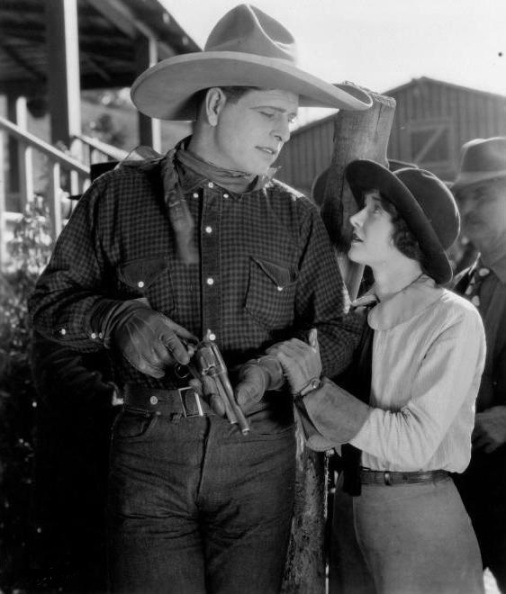 In January of 1926 Marceline Day played in "Western Pluck" with Art Acord, another star of Western films. 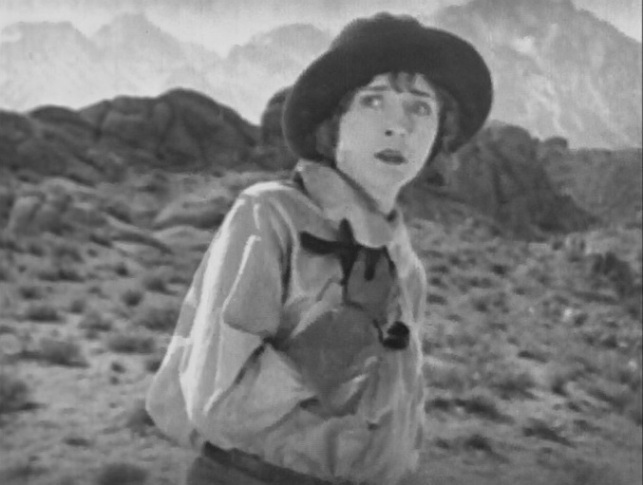 The critics said that “Marceline Day is a vivacious heroine...she plays the role in an appealing manner.” In March of 1926 Marceline Day was one of four leading characters in another powerful drama about the Western frontier - "The Barrier". 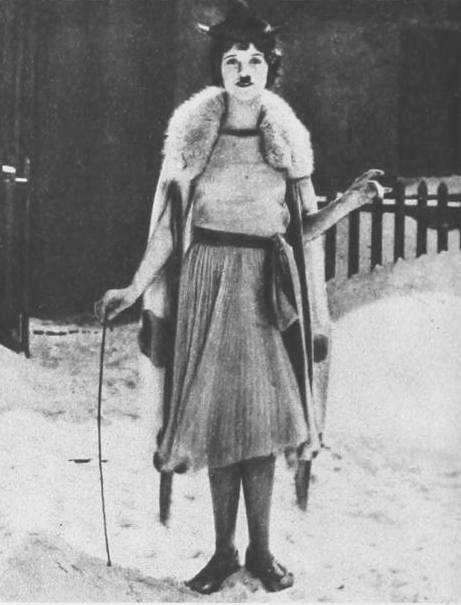 Critics described her as "an actress of real merit...with a distinguished performance", they "hailed her work as one of the outstanding feminine portrayals of the year". 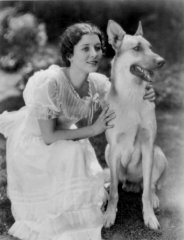 Later in 1926 at the age of 18 Marceline Day was the leading character and owned the tremendous success of no less than three critically acclaimed films: "The Boy Friend", made by MGM, and "That Model from Paris" and "College Days", both made by Tiffany. There isn't a movie magazine or a newspaper of the era that does not give Marceline Day rave reviews for her outstanding performances. Those include Film Daily, Photoplay, Film Year Book, Motion Picture Classic, Motion Picture News, Motion Picture Magazine, Variety, Moving Picture World, and many other domestic and International film editions. 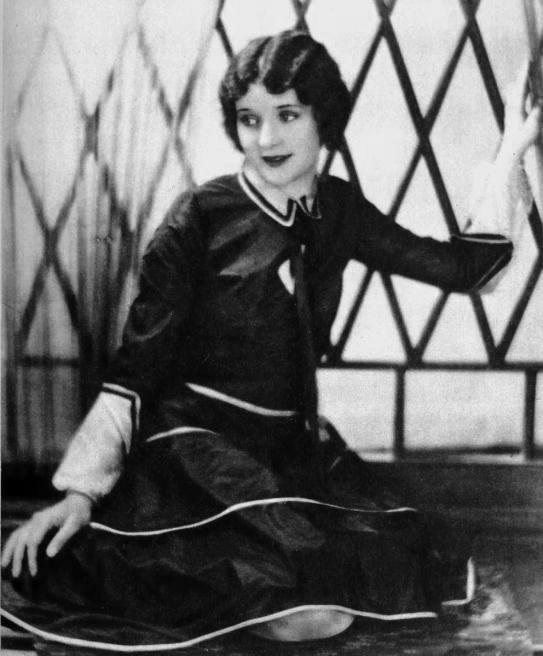 Critics said that in "The Boy Friend" Marceline Day's acting "is a revelation of sympathetic charm", it is "an excellent effort, that shows maturity of judgment, and more than ordinary ability". 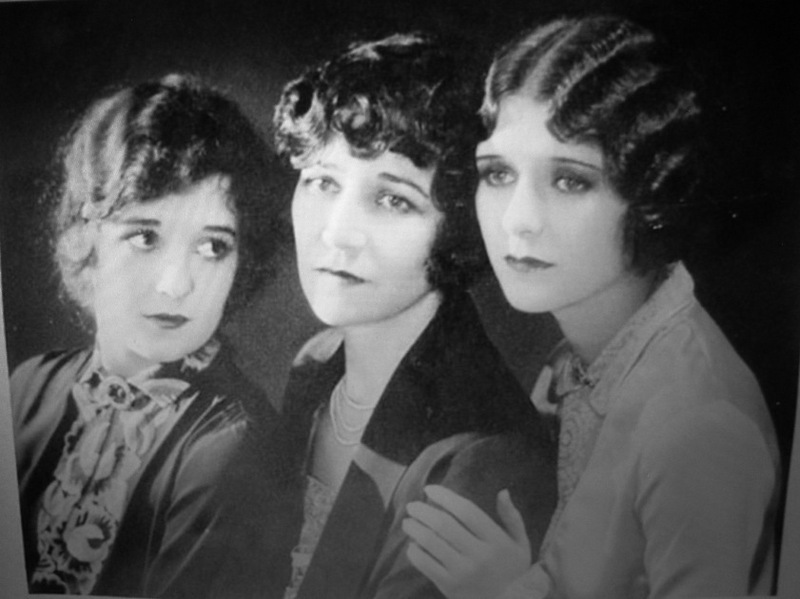 "Marceline Day reveals a talent for drama that is amazing. Miss Day is that rare combination, a girl with a real personality and acting ability." "Marceline Day is sitting pretty at the top of the celluloid ladder, a fact you can discover for yourself when you see her in "The Boy Friend"". 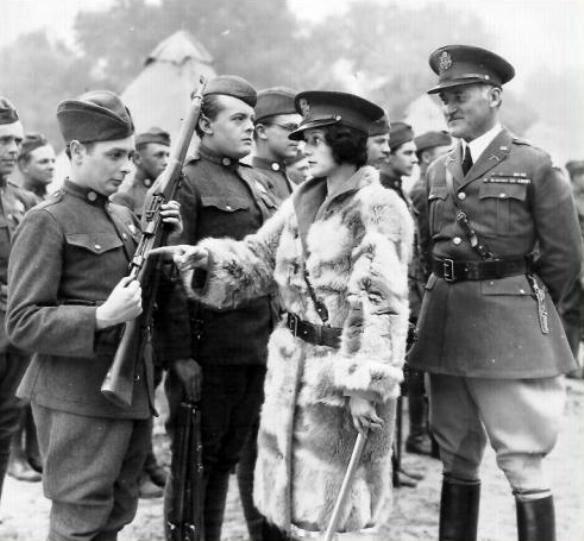 In mid 1926 it was announced that "Marceline Day's contract with the MGM forces has been extended, because of her exceptional work in three MGM productions - "The Barrier", "The Gay Deceiver" and "The Boy Friend"". 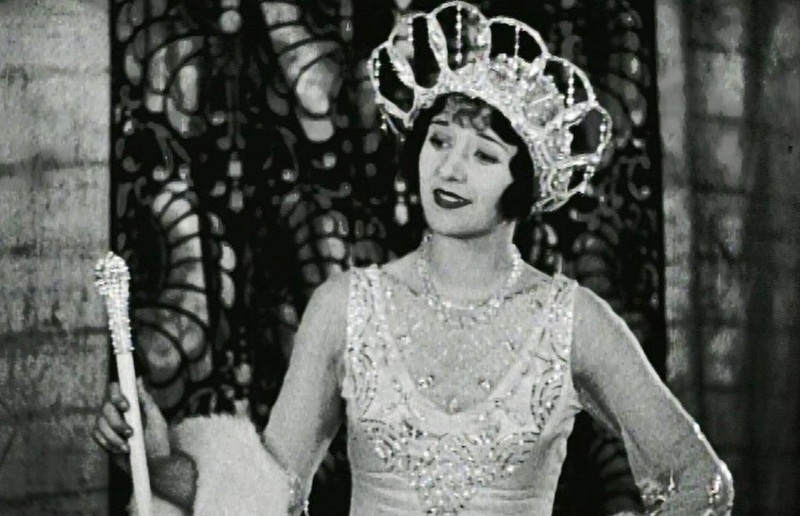 Also in the news at that time was that "Mae Busch and Marceline Day in the "Fools of Fashion" drew full houses to the theater throughout the week with big box office results being reported". 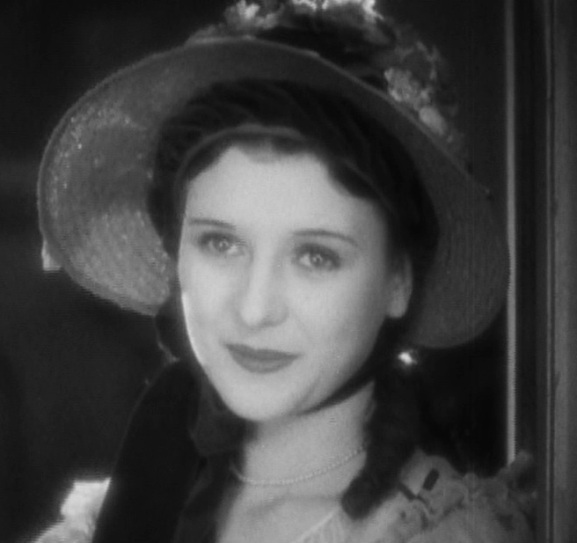 Critics also noted: "That Model from Paris" is important in that "it brings to the fore a new luminary in the person of Marceline Day in the leading role", and "College Days" "brings down the plaudits of the trade reviewers. 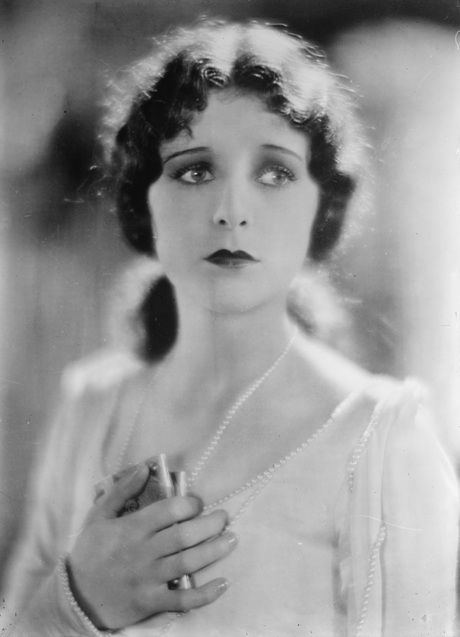 Marceline Day contends for a place among the upper flight of popular screen personalities". In early 1927 Marceline Day co-starred with J. Barrymore in the historical drama "The Beloved Rogue". Critics said that she "shines brilliantly in innumerable scenes" and "makes the film the most colorful, romantic screen story in the history of motion pictures". In the contemporary drama "Red Clay" William Desmond "is brilliantly supported by Marceline Day". 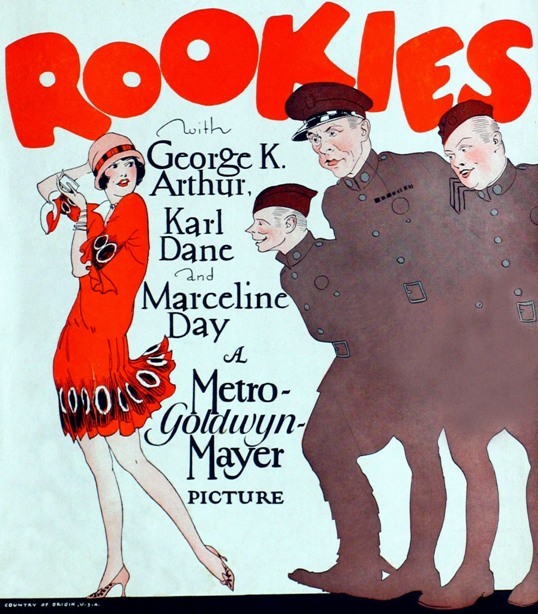 In the critically acclaimed comedy "Rookies" Karl Dane and George K. Arthur, aided by Marceline Day, were "responsible for many an aching side when they took the big parts in that intensely funny screen comedy". "The merriment was uproarious and the throng howled and shrieked". 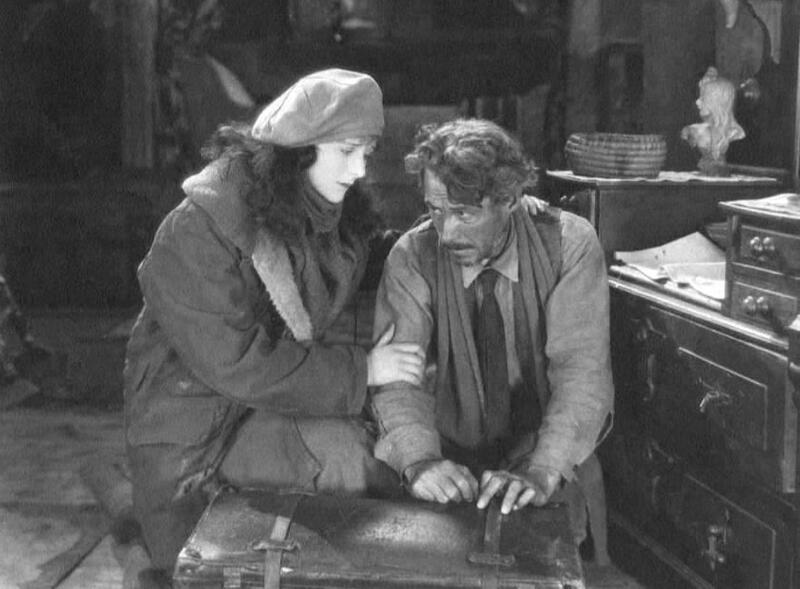 In May that year Marceline Day co-starred with Lars Hanson in the powerful historical drama "Captain Salvation", directed by John S. Robertson. Critics said that she "is surely stepping into the star class", as she stepped into her 19th year of age. 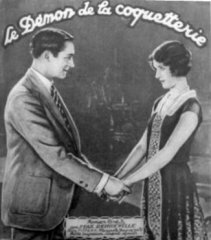 In "The Road to Romance", again directed by John S. Robertson, opposite the hero of "Ben-Hur" Ramon Novarro Marceline Day delivered another stellar performance. Critics said that she "is more charming and beautiful than ever" and that she "plays the part with striking sincerity and charm". In the mystery thriller classic "London After Midnight" Marceline Day was a leading lady to Lon Chaney, the master of mystery thrillers. Critics said that "she plays her part in a convincing manner". "London After Midnight" is considered the most sought after of all lost films. 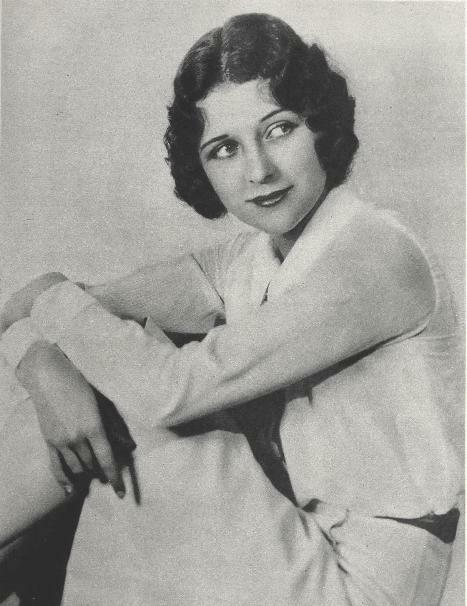 1928 was also a strong year for Marceline Day. 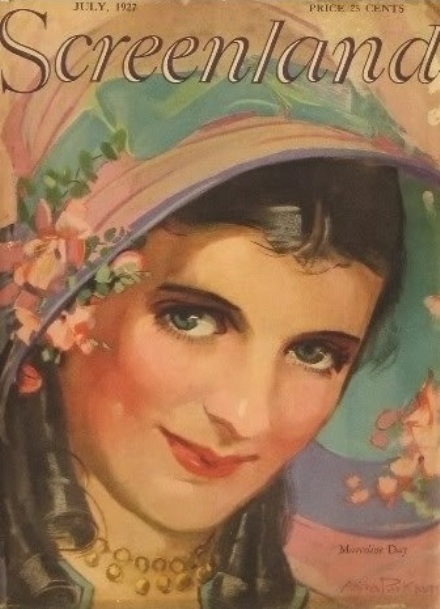 In the war drama "Under the Black Eagle" she partnered with Ralph Forbes and critics praised her performance, saying that "Marceline Day does some excellent emotional acting". In the crime drama "The Big City" starring Lon Chaney and Marceline Day the critics commended her acting by saying: "Marceline Day has the big female lead,...she does splendidly with her role,... she is appealing,...makes an admirable study if the role, lives up to her name as 'Sunshine', the sweetness of her smile capturing all hearts". In the romantic comedy "A Certain Young Man", where she partnered again with Ramon Novarro, "Marceline Day appears opposite the star as a leading lady, and, as usual, acquits herself with the highest honors...gives a most appealing performance ". 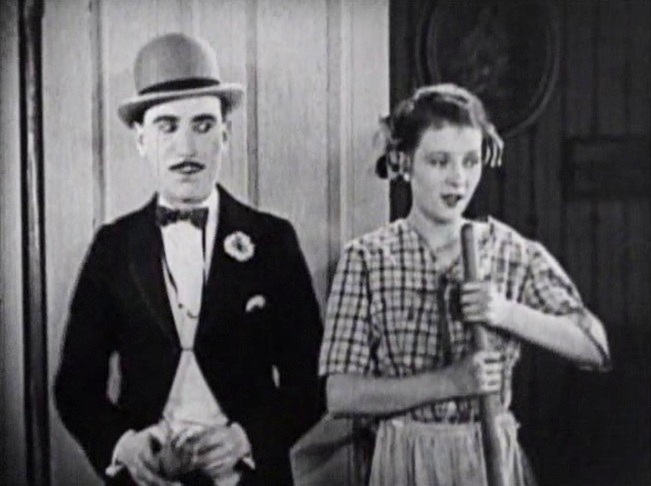 For her role in the comedy "Detectives", where she partnered one more time with Karl Dane and George K. Arthur, she was praised by critics again: "Marceline Day gives a most pleasing performance". Marceline Day shone brightly and sweetly in the classic romantic comedy "The Cameraman" with the one and only Buster Keaton, a film that was used by MGM to teach comedians for generations. Marceline Day is one of the reasons why this film is so universally acclaimed both by the critics and by the public. "The Cameraman" has an outstanding ranking of 8.3 in IMDB. 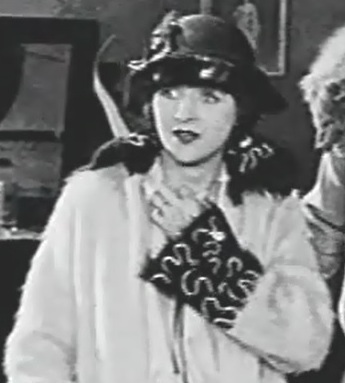 Amateur reviewers from the site Mythical Monkey have described Marceline Day's performance in this film as worthy of an Oscar. "The Cameraman" was added to the National Film Registry in 2005 as being deemed "culturally, historically, or aesthetically significant". 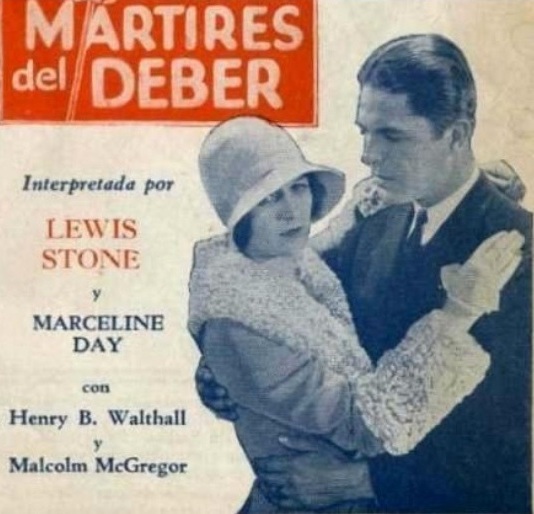 For her role in the political drama "Freedom of the Press" the critics commented that Marceline Day "plays admirably her part in a stellar cast", which included Lewis Stone, Malcolm McGregor and Henry Walthall. For the society drama "Restless Youth" starring Marceline Day supported by Ralph Forbes the reviews were: "Excellent, the best program picture in a long while. 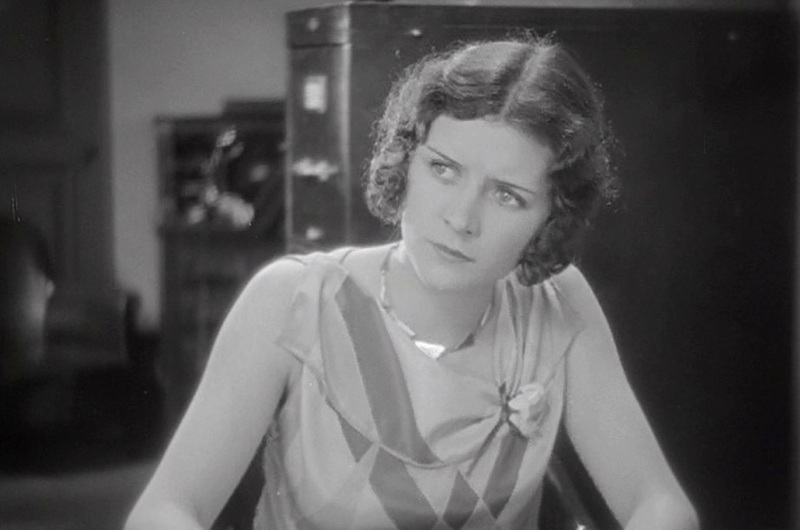 Marceline Day's acting very good. Best of luck and success to you, Miss Day". 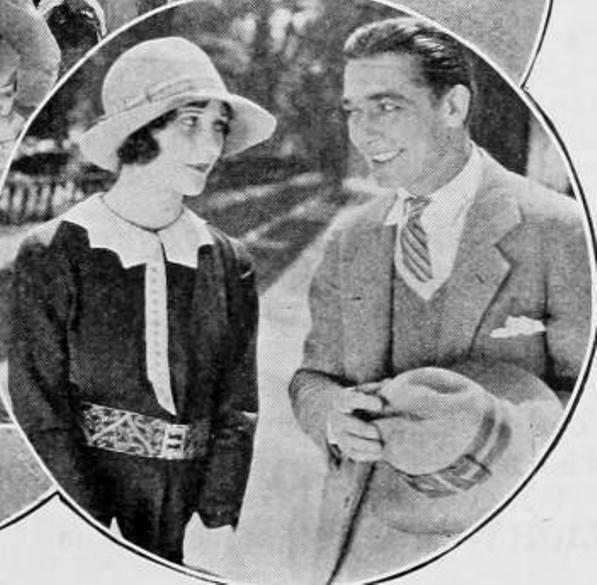 "Stolen Love" is "an absorbing story with an outstanding cast headed by Marceline Day and Owen Moore; their excellent acting in this photoplay will win for them new laurels", noted the pundits. 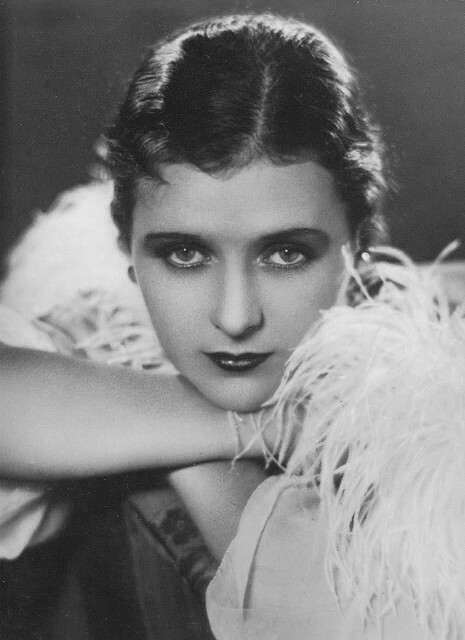 Even in one film that was not universally praised by critics, "The Jazz Age" opposite Douglas Fairbanks Jr., Marceline Day earned positive reviews for her performance : "Marceline Day is better than the film". 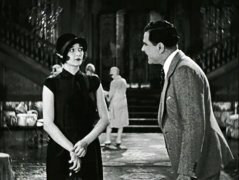 In early 1929 Marceline Day played in the comedy "A Single Man" and deserved high critic praise again: the film "gives Lew Cody, Aileen Pringle and Marceline Day an opportunity for some brilliant acting". 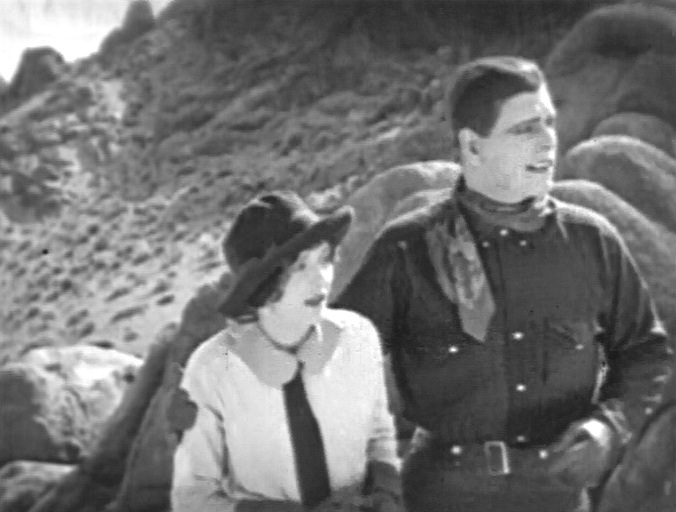 "Trent’s Last Case" is a thrilling murder mystery, featuring an all-star cast; "Marceline Day is charming and appealing", commented the critics. The cast includes Raymond Griffith, Raymond Hatton and Donald Crisp. 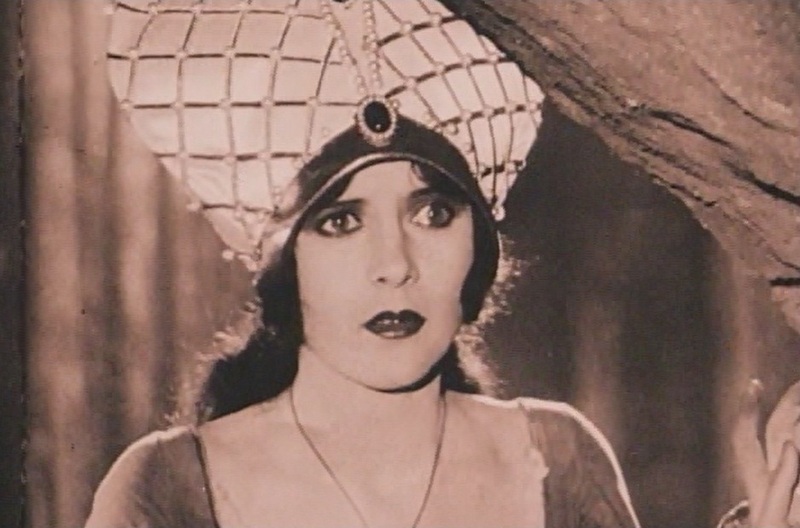 Marceline Day's last silent film is the oriental drama "The One Woman Idea". 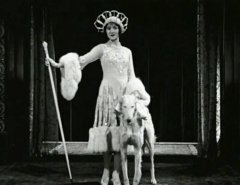 Critics said that "Marceline Day, leading woman, portrays a dual role, and is everything that could be asked in both". 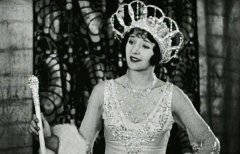 Nowadays Marceline Day is judged almost exclusively by her sound films from the early 1930ies, which are readily available, generally belong to the so-called B-category and are inferior in artistic quality compared to her silent films. However, this judgement is wrong, as it would be wrong to judge Buster Keaton almost exclusively by his sound films from the early 1930ies, which are inferior in artistic quality compared to his silent films. Buster Keaton's renaissance came from the recognition of his silent films as masterpieces. Similarly, Marceline Day's true legacy belongs to the silent era of motion pictures and the masterpieces that she helped create during that period. 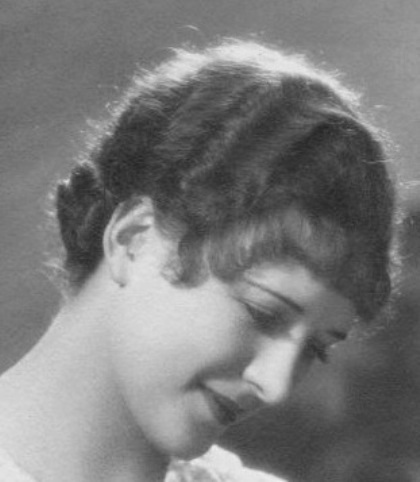 Of her 33 high quality feature silent films, in which Marceline Day partnered with top male stars, played her most memorable roles, and earned the highest praise of the critics, until recently only 4 were available on DVD: "The Beloved Rogue", "Captain Salvation", "The Cameraman" and "The White Outlaw". 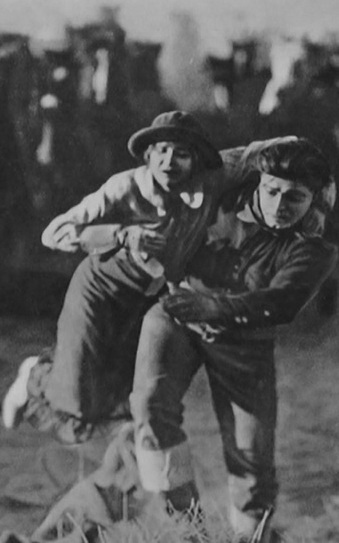 Thanks to the efforts of Silent Hall of Fame two more silent masterpieces are now also available - "That Model from Paris" (1926) and "College Days" (1926). Unfortunately, the other 27 silent films with Marceline Day are lost, misplaced or otherwise unavailable. Finding and bringing back to the public Marceline Day's superior silent films will restore her name and legacy as one of the most illustrious female silent movie stars of the 1920ies. 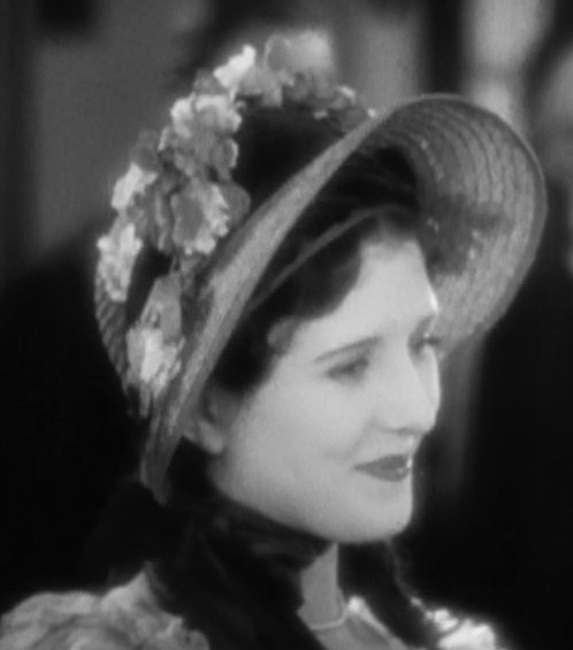 The innumerable praises and glowing critic reviews, some of which were shown above, are a testament to Marceline Day's true ranking among the top movie stars of the Silent Era. 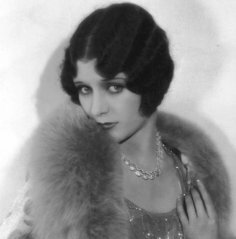 Unfortunately little is known about the 66 years of Marceline Day's life after she retired from acting in 1933. She meticulously avoided the attention of the media and stayed away from Hollywood. Unlike most movie personalities Marceline Day never sought any awards or recognition. She remained the gentle and quiet beauty of the Silent Era until the end. 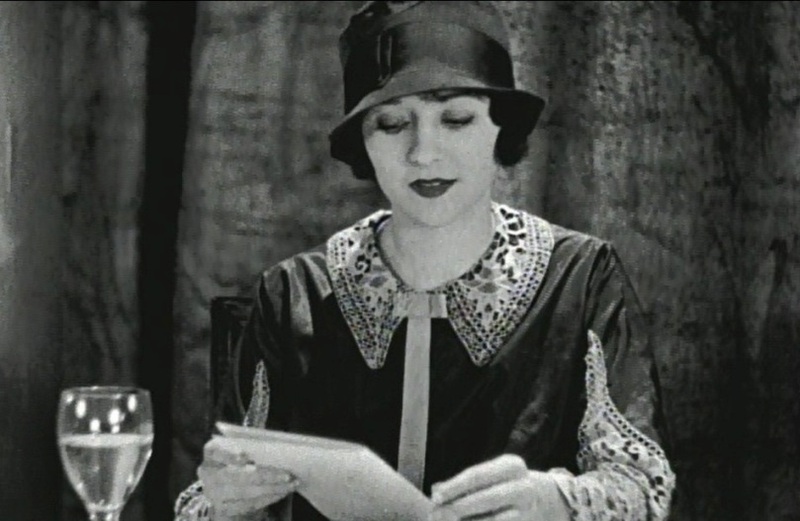 Marceline Day checks the menu in "That Model from Paris" (1926). 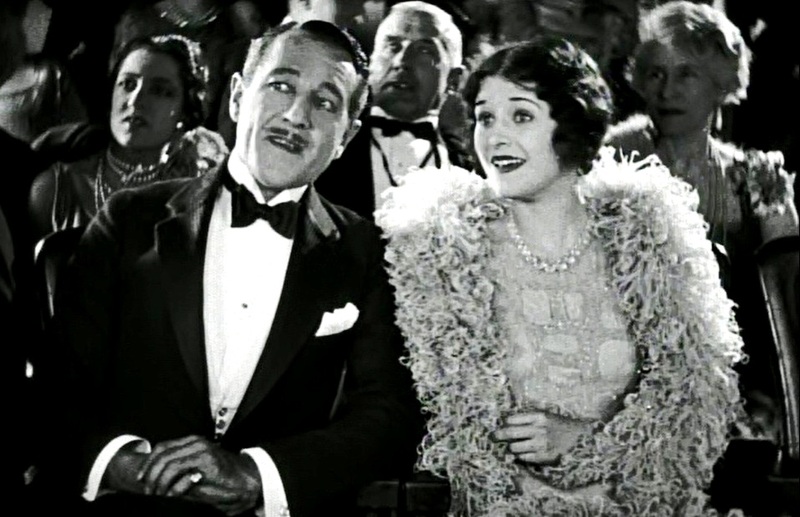 Marceline Day and Crauford Kent watch a show in "That Model from Paris" (1926). 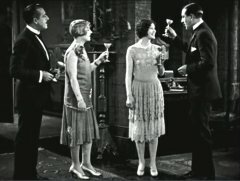 Crauford Kent, Eileen Percy and Ward Crane raise a toast to Marceline Day's new job in "That Model from Paris" (1926). 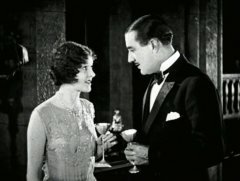 Marceline Day needs encouragement from Ward Crane to try her first drink in "That Model from Paris" (1926). 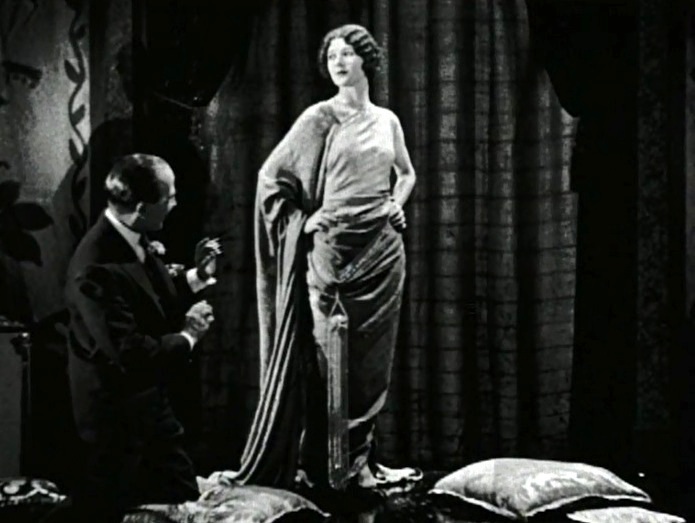 Marceline Day poses as Arthur Hoyt puts the finishing touches to the gown in "That Model from Paris" (1926). Marceline Day does a good modeling job in "That Model from Paris" (1926). Marceline Day looks on as Bert Lytell tries to communicate with her without words in "That Model from Paris" (1926). 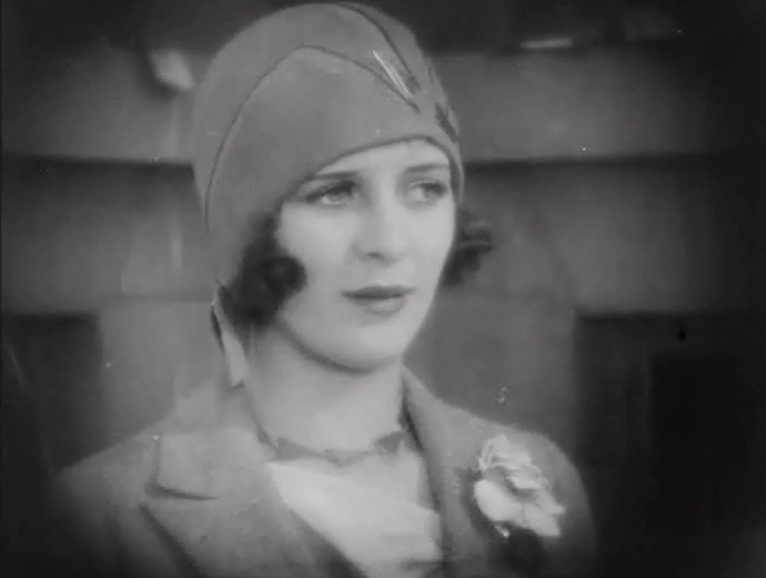 Marceline Day shines as the top model of the fashion house in "That Model from Paris" (1926). 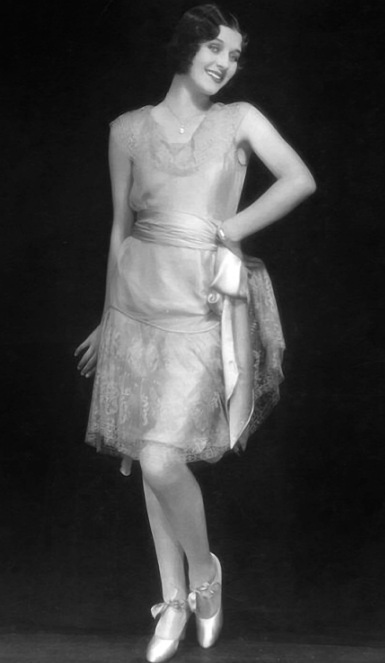 Marceline Day sparkles as the top model of the fashion house in "That Model from Paris" (1926). Marceline Day gets an unexpected knock on her door in "That Model from Paris" (1926). Marceline Day sees an intruder in "That Model from Paris" (1926). Marceline Day and Jack Hoxie in a nice portrait for "The White Outlaw" (1925). Marceline Day and Jack Hoxie in another nice portrait for "The White Outlaw" (1925). Marceline Day sees Jack Hoxie lying on the ground in "The White Outlaw" (1925). 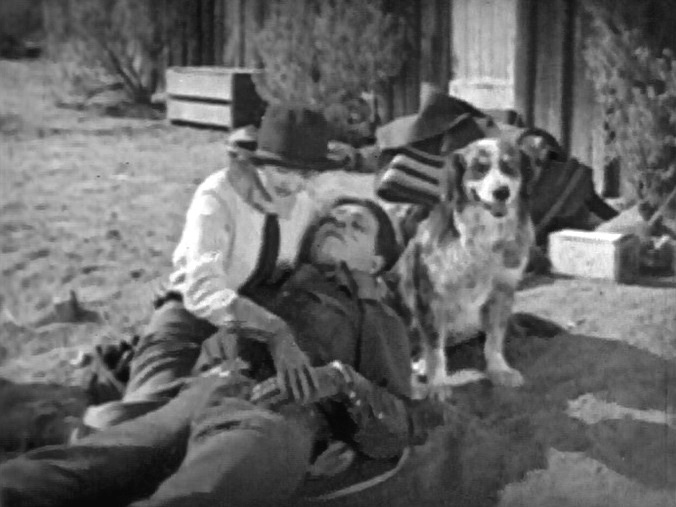 Marceline Day comforts Jack Hoxie in "The White Outlaw" (1925). 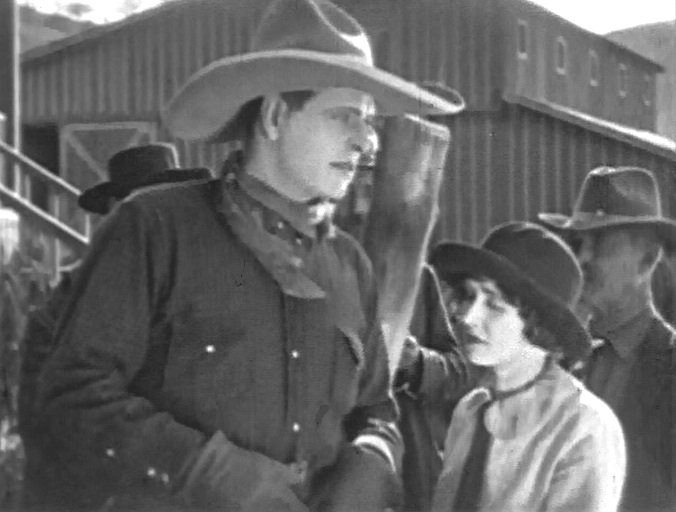 Marceline Day and Jack Hoxie worry about his white horse in "The White Outlaw" (1925). Marceline Day and Jack Hoxie after escaping danger in "The White Outlaw" (1925). Marceline Day and Jack Hoxie in a poster for "The White Outlaw" (1925). Marceline Day is excited that her boyfriend is returning from seminary in "Captain Salvation" (1927), directed by John S. Robertson. 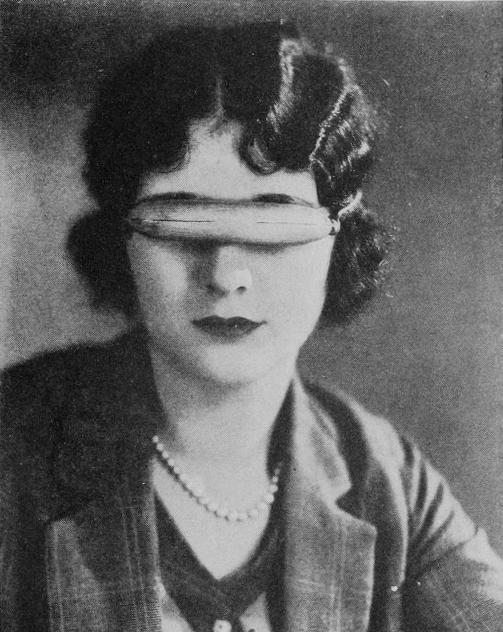 Marceline Day can't take her eyes off her man in "Captain Salvation" (1927), directed by John S. Robertson. Marceline Day and her boyfriend discuss dating plans in "Captain Salvation" (1927), directed by John S. Robertson. Marceline Day listens to her boyfriend in "Captain Salvation" (1927), directed by John S. Robertson. Marceline Day is happy to be with her boyfriend again in "Captain Salvation" (1927), directed by John S. Robertson. Marceline Day suffers in "Captain Salvation" (1927), directed by John S. Robertson. Marceline Day is ready to defend her man in "Captain Salvation" (1927), directed by John S. Robertson. Marceline Day welcomes her man again in "Captain Salvation" (1927), directed by John S. Robertson. Marceline Day in "Captain Salvation" (1927). A painting gracing the cover of Screenland magazine - July 1927. Marceline Day in "Captain Salvation" (1927). 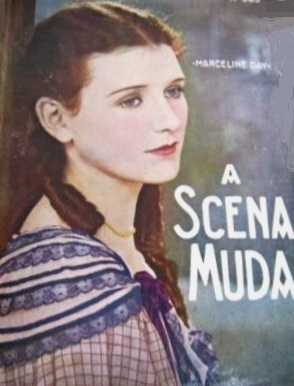 A color photograph gracing the cover of the Brazilian magazine Silent Screen. Marceline Day must marry a hated man in "The Beloved Rogue" (1927). Marceline Day enjoys a walk in the garden in "The Beloved Rogue" (1927). 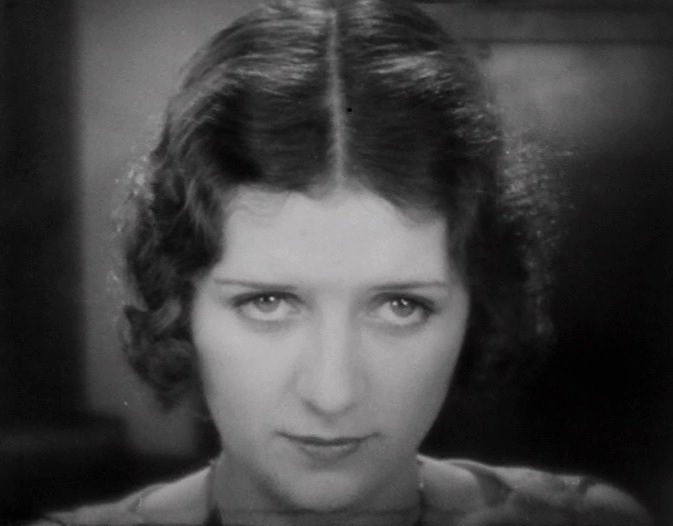 Marceline Day looks at her suitor in "The Beloved Rogue" (1927). Marceline Day keeps her distance from her suitor in "The Beloved Rogue" (1927). Marceline Day and John Barrymore in a romantic scene in "The Beloved Rogue" (1927). 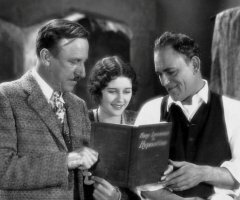 Marceline Day is relaxed, John Barrymore not too much so in "The Beloved Rogue" (1927). Marceline Day is horrified to see her beau in the cage in "The Beloved Rogue" (1927). Marceline Day suffers in "The Beloved Rogue" (1927). Marceline Day in a nice publicity still for the film "The Beloved Rogue" (1927). Marceline Day in another nice publicity still for the film "The Beloved Rogue" (1927). 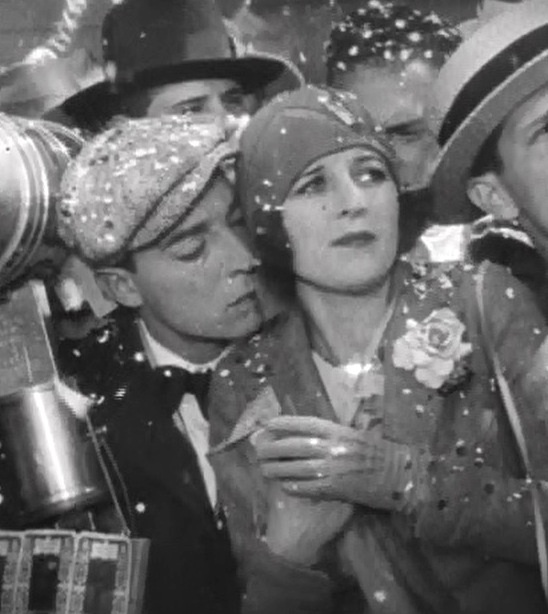 Marceline Day is adored by Buster Keaton as they are squeezed together by the crowd in "The Cameraman" (1928). 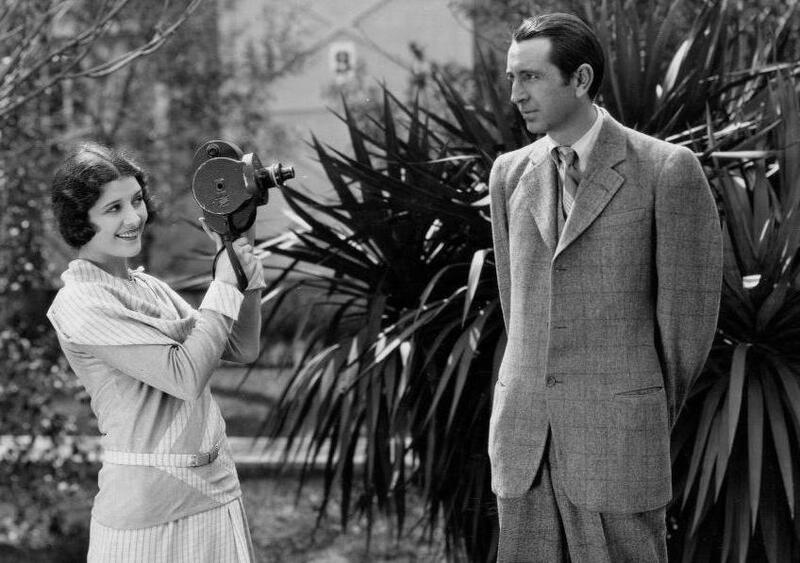 Marceline Day poses to Buster Keaton for a tintype in "The Cameraman" (1928). Marceline Day receives a tintype as a present from Buster Keaton in "The Cameraman" (1928). 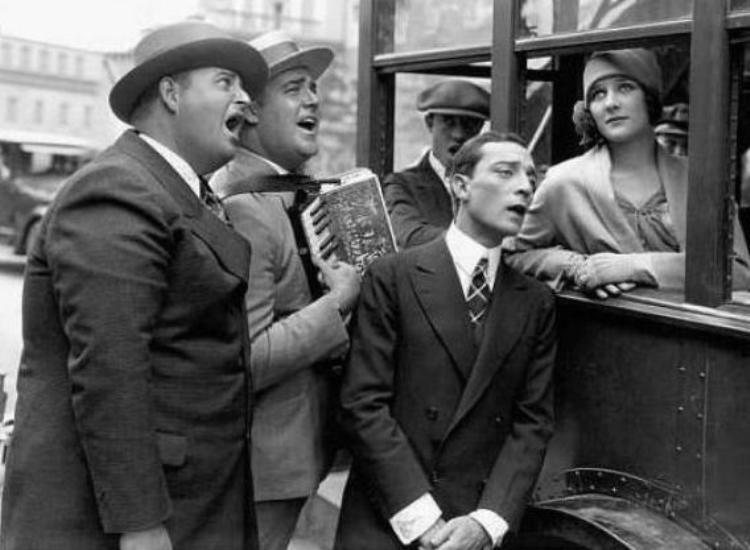 Marceline Day notices that she is the object of Buster Keaton's attention in "The Cameraman" (1928). Marceline Day looks anxiously as Buster Keaton brings his second-hand camera in "The Cameraman" (1928). Marceline Day is worried as Buster Keaton fails the camera trial in "The Cameraman" (1928). Marceline Day and Buster Keaton almost kiss by accident in "The Cameraman" (1928). 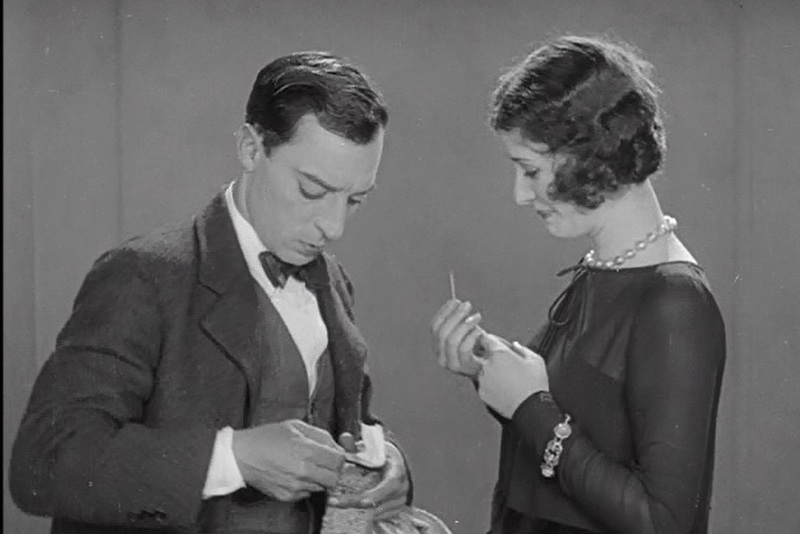 Marceline Day asks Buster Keaton again for his phone number after he gave her the pencil in "The Cameraman" (1928). Marceline Day in "The Cameraman" (1928). 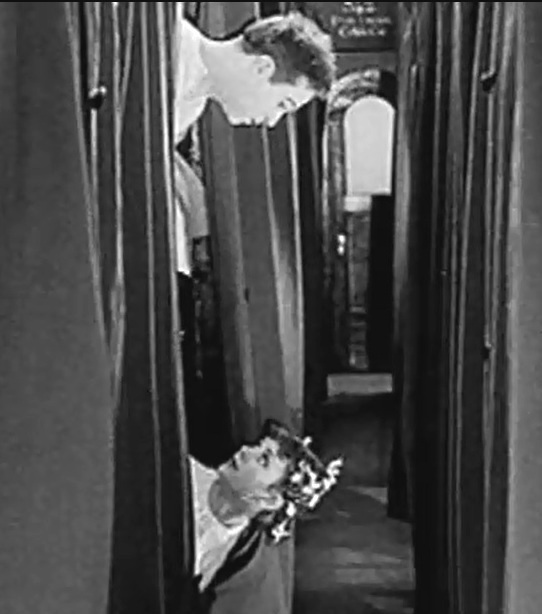 She talks on the phone to Buster Keaton, who at the same time is sprinting across town to meet her at her home. 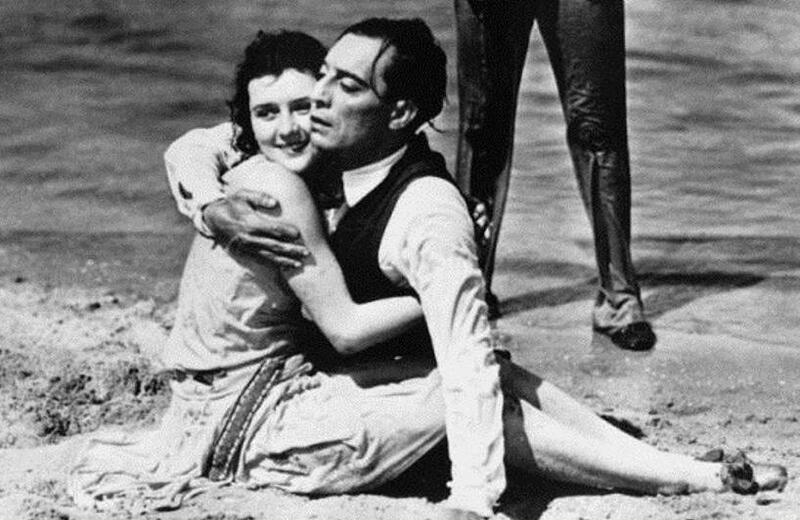 Marceline Day gives Buster Keaton a kiss on the cheek in "The Cameraman" (1928). Marceline Day tells Buster Keaton "I can't thank you enough for saving my life" in "The Cameraman" (1928). Marceline Day and Ramon Novarro in a very nice photo from "A Certain Young Man" (1928). Marceline Day and Ramon Novarro in a scene from "A Certain Young Man" (1928). Marceline Day and Ramon Novarro in a romantic scene from "A Certain Young Man" (1928). Marceline Day and Ramon Novarro in "The Road to Romance" (1927), directed by John S. Robertson. Marceline Day is embraced by Ramon Novarro in "The Road to Romance" (1927), directed by John S. Robertson. 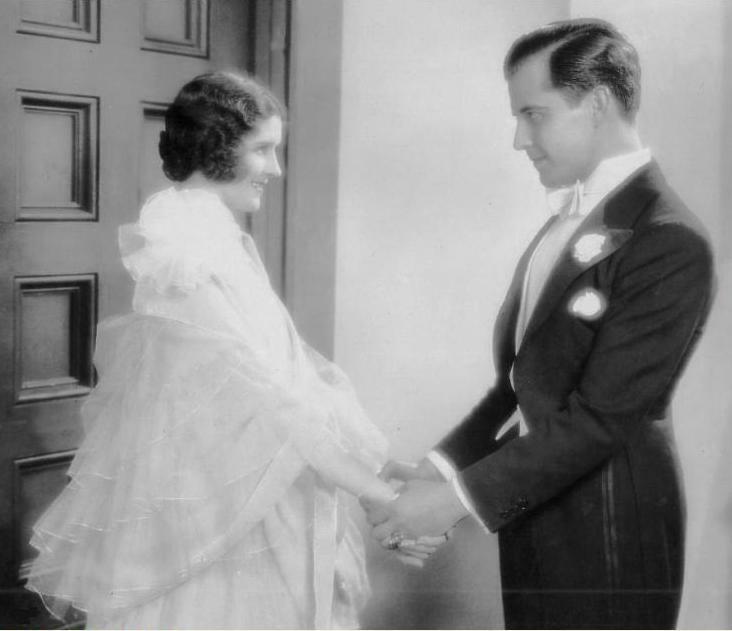 Marceline Day is courted by Ramon Novarro in "The Road to Romance" (1927), directed by John S. Robertson. The absolute charm: Marceline Day poses in a beach suitfor a wonderful portrait during the filming of "The Road to Romance" (1927) with Ramon Novarro, director John S. Robertson. Marceline Day was not only a big movie star, but she also had a radiant personality and was universally liked by everyone around her - here she is with director John Robertson and costar Ramon Novarro on the set of "The Road to Romance" (1927). 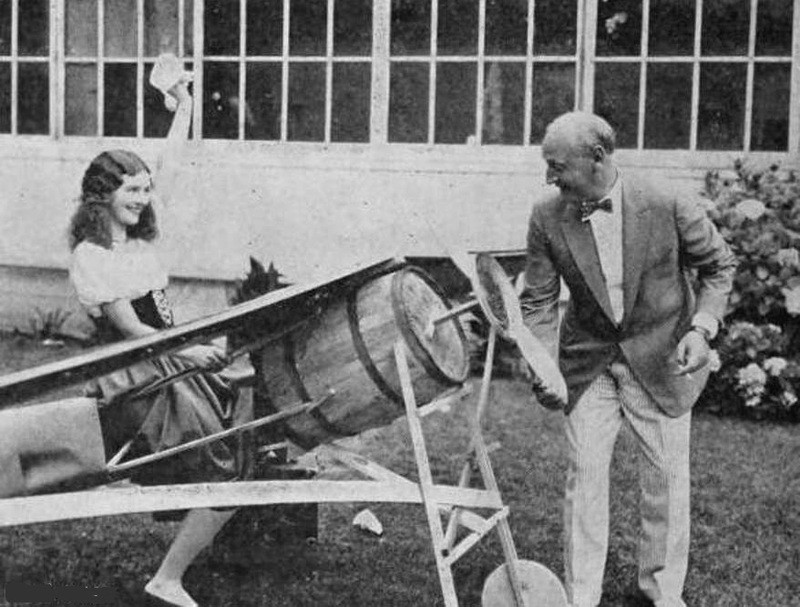 Director John Robertson turns the propeller of Marceline Day's "airplane" on the set of "The Road to Romance" (1927). Marceline Day is serenaded by director Edward Sedgwick, co-star Buster Keaton and others on the set of "The Cameraman" (1928). Marceline Day, director Tod Browning and co-star Lon Chaney check out the book "Easy reading in hypnotism" on the set of "London After Midnight" (1927). 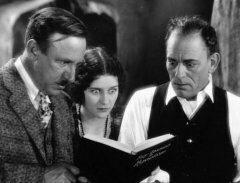 Marceline Day, director Tod Browning and co-star Lon Chaney seem horrified at what they see in the book "Easy reading in hypnotism" on the set of "London After Midnight" (1927). Marceline Day with Henry Walthall and Lionel Barrymore in a candid portrait for "The Barrier" (1926). 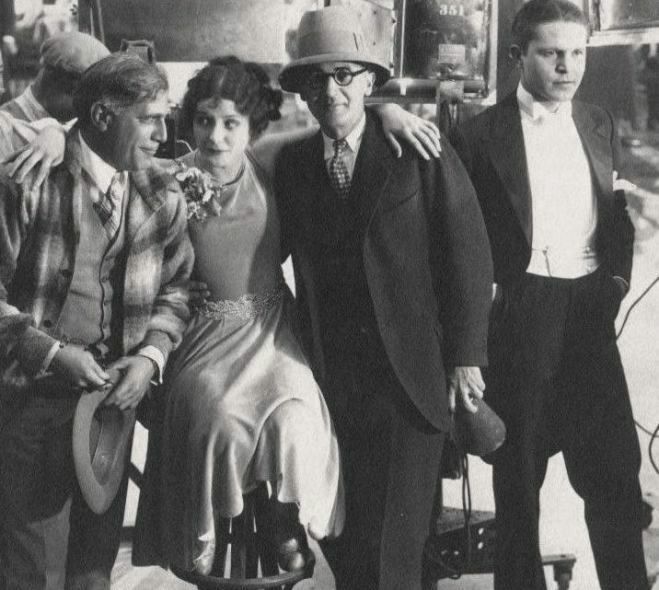 Marceline Day gets a visit from friend Mack Sennett on the set of "The Gay Deceiver" (1926) with director John M. Stahl and co-star Malcolm McGregor. 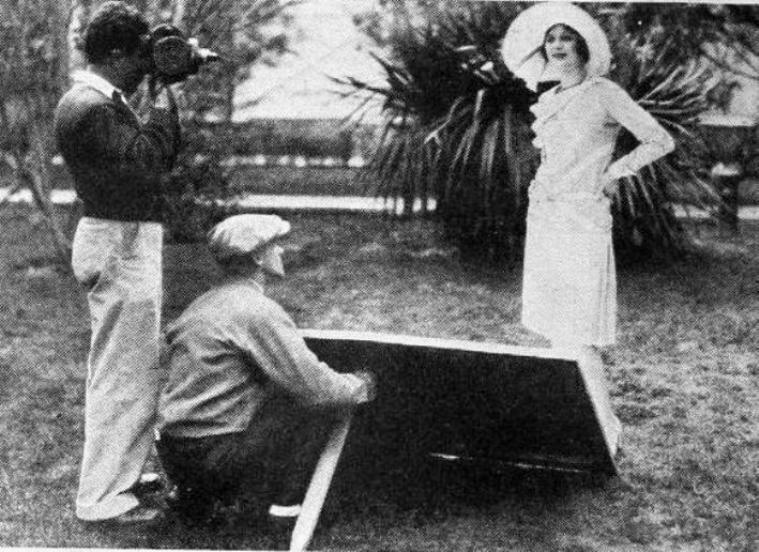 Marceline Day tests her new camera on director Malcolm St. Clair, who was working at the time on "Beau Broadway" (1928) with Lew Cody and Aileen Pringle. 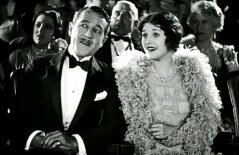 Marceline Day co-starred with these two a few months later in the nice comedy "A Single Man" (1929). Marceline Day and Buster Keaton talk to each other with their eyes on the set of "The Cameraman" (1928). Marceline Day and Buster Keaton talk to each other with their eyes again on the set of "The Cameraman" (1928). 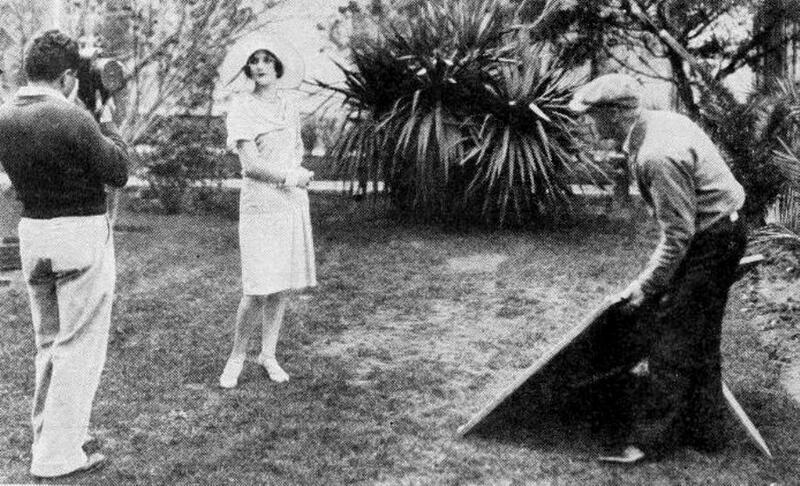 Marceline Day and Buster Keaton on the set of "The Cameraman" (1928). Marceline Day in a splendid double portrait. Marceline Day with a beautiful dress choosing between a cotton and a silk stocking - 1927. Marceline Day - luminously lovely on the set of Rookies (1927). 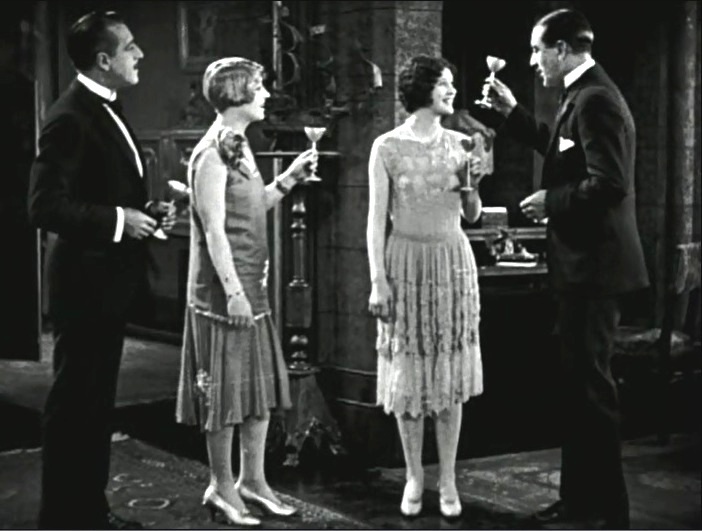 Marceline Day asks Harry Langdon for a glass of water in "The Luck o' the Foolish" (1924). 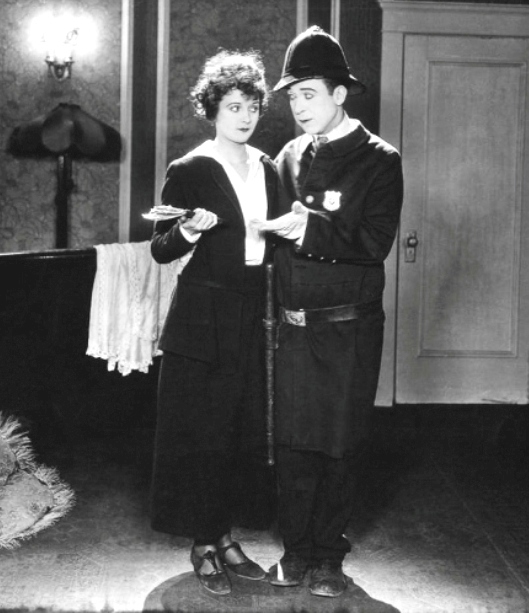 Marceline Day recovers Harry Langdon's stolen wallet in "The Luck o' the Foolish" (1924). Marceline Day and Harry Langdon in a publicity still for the film "The Luck o' the Foolish" (1924). Marceline Day and Jack Richardson in "Black Oxfords" (1924). 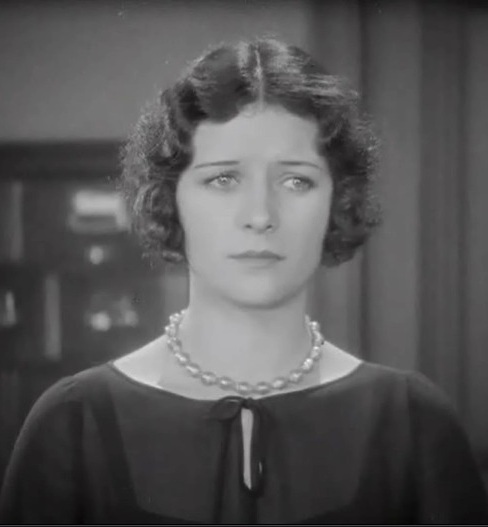 Marceline Day investigates in "Detectives" (1928). Marceline Day and Carl Dane in "Detectives" (1928). 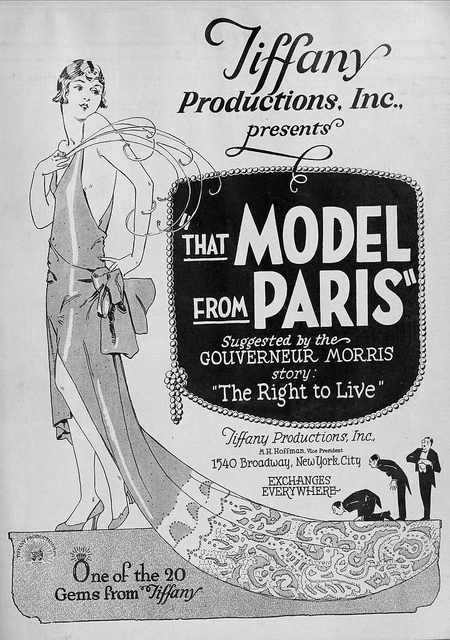 A beautiful poster for the film "That Model from Paris" (1926) starring Marceline Day. 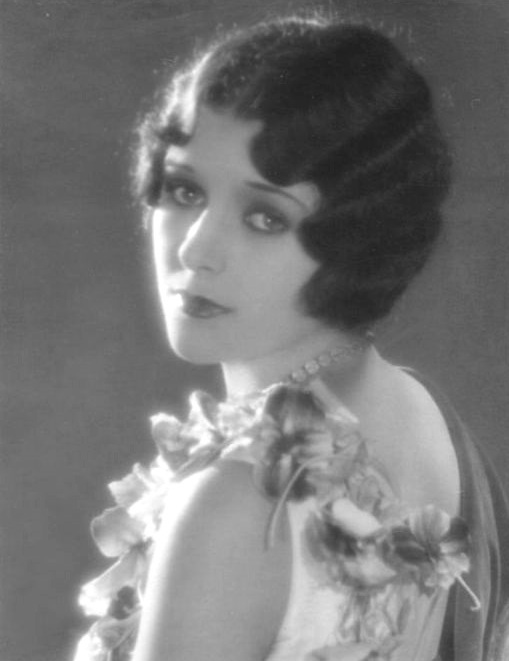 Marceline Day - beauty, grace and charm. 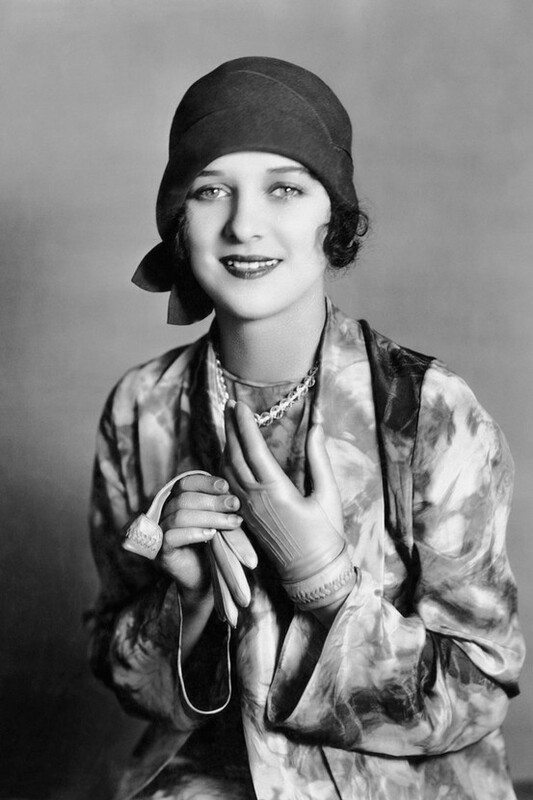 Marceline Day is sweet and charming in 1926, when critics called her "a new luminary" of the screen. 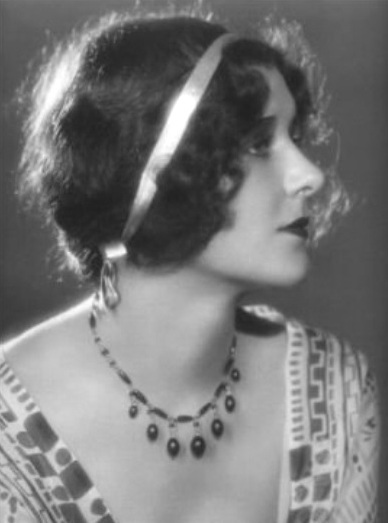 Marceline Day - world class beauty. Marceline Day relaxed and confident in a wonderful portrait. 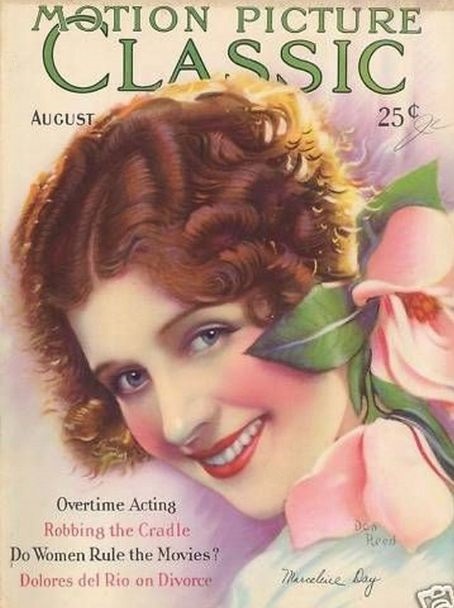 Marceline Day graces the cover of Motion Picture Classic magazine - August 1928. 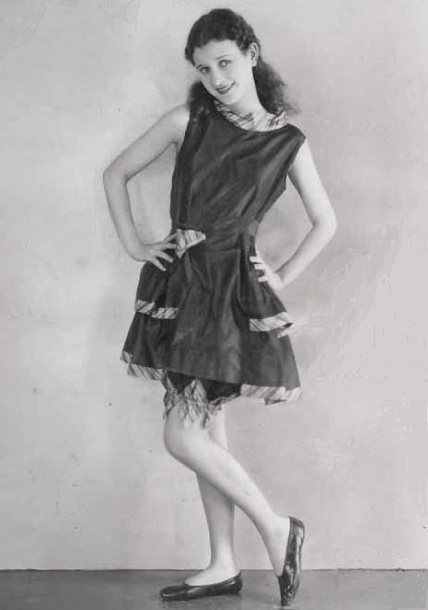 Marceline Day with a beautiful dress. 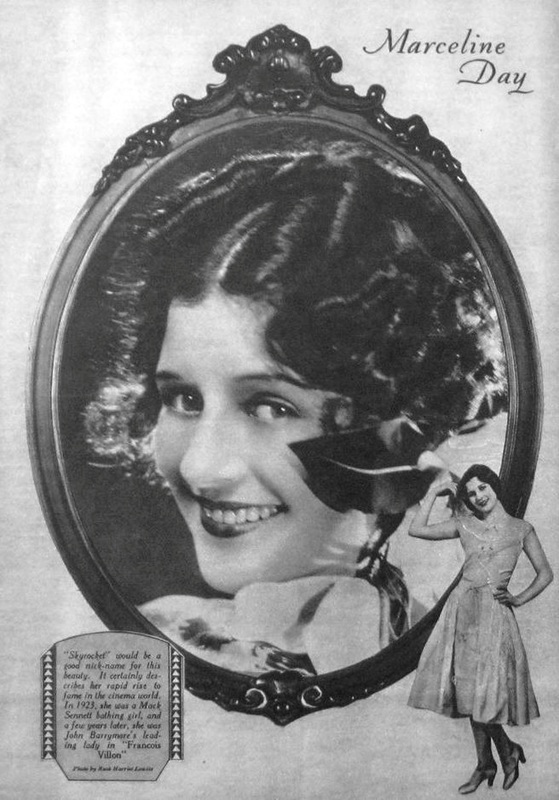 Marceline Day in the Hall of Fame. 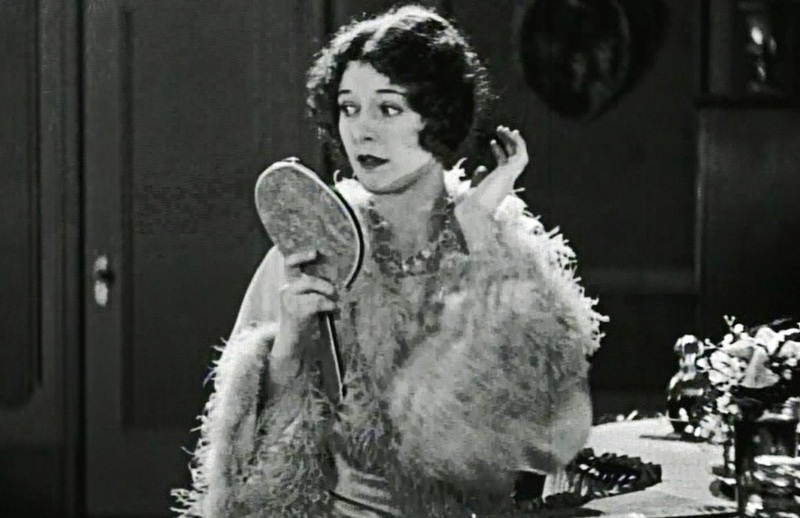 Marceline Day worries about her fiance Harry Langdon in "The Hansom Cabman" (1924). 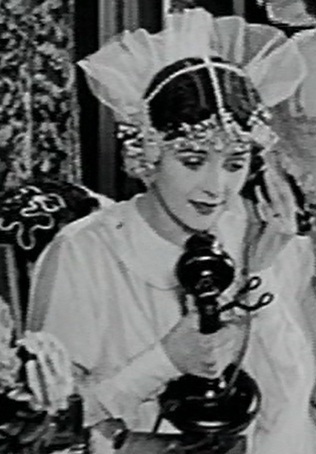 Marceline Day talks on the phone to her fiance Harry Langdon in "The Hansom Cabman" (1924). Marceline Day and sister Alice Day in a beautiful portrait - late 1925. Marceline Day and John Harron in a scene from "The Boy Friend" (1926). 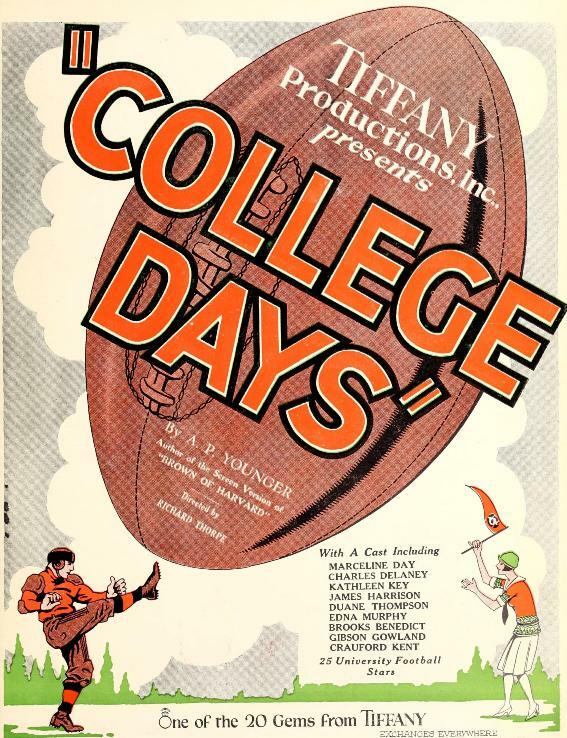 A very nice poster for the film "College Days" (1926) starring Marceline Day. 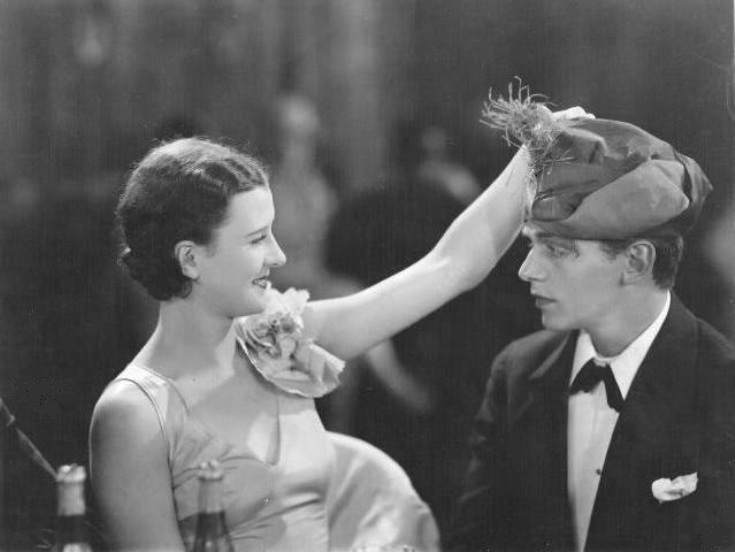 Marceline Day and Charles Delaney in "College Days" (1926). 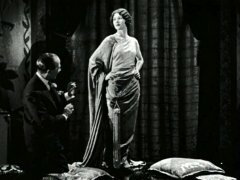 Marceline Day and Theodore von Eltz in "Fools of Fashion" (1926). A picture published on the cover of the French magazine "Complete Film". Marceline Day with Eskimos glasses for the film The Barrier (1926). Marceline Day and her adoptive father Henry Walthall comfort each other in "The Barrier" (1926). 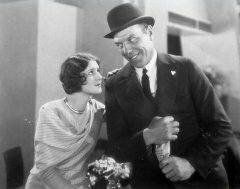 Marceline Day and Henry Walthall in "The Barrier" (1926). Sister Alice Day, mom Irene and Marceline Day in a beautiful portrait. 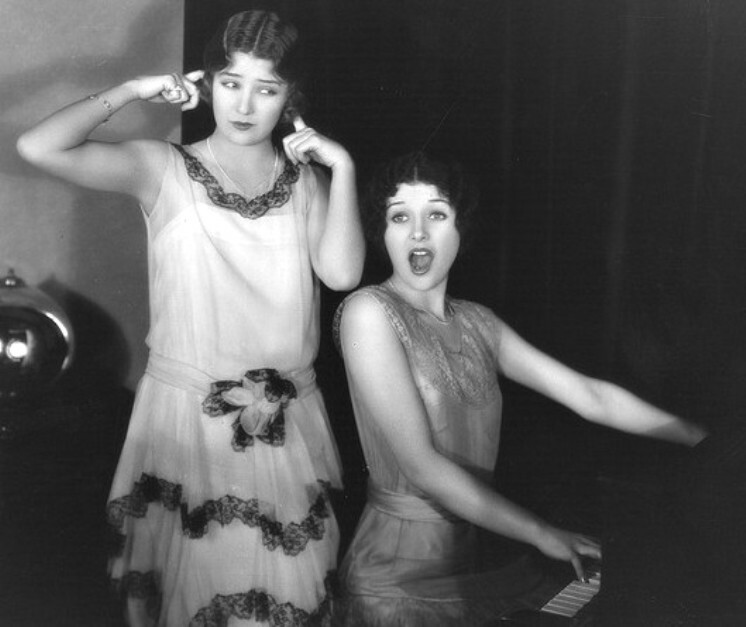 Marceline Day plays the piano and sings for sister Alice. 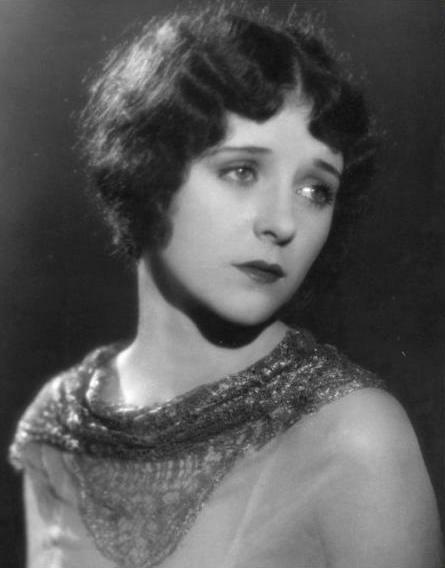 Marceline Day - gentle and charming in a magnificent portrait. Marceline Day in a nice portrait with a flower dress. 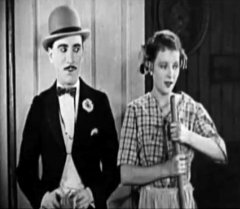 Marceline Day and Charlie Chaplin were friends and she visited his parties. Here she is imitating his famous tramp. Marceline Day in a gorgeous portrait with flower. A nice poster for "Rookies" (1927) with Marceline Day, George Arthur and Carl Dane. Marceline Day and Douglas Fairbanks Jr. in "The Jazz Age" (1929). 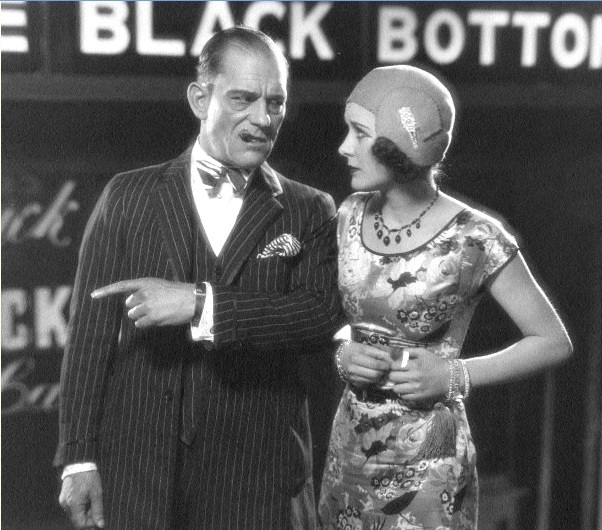 Lon Chaney and Marceline Day in "The Big City" (1928). Fine emotional acting. Marceline Day as Sunshine in "The Big City" (1928). Marceline Day and Lon Chaney in "The Big City" (1928). Marceline Day in a nice portrait for "The Big City" (1928). 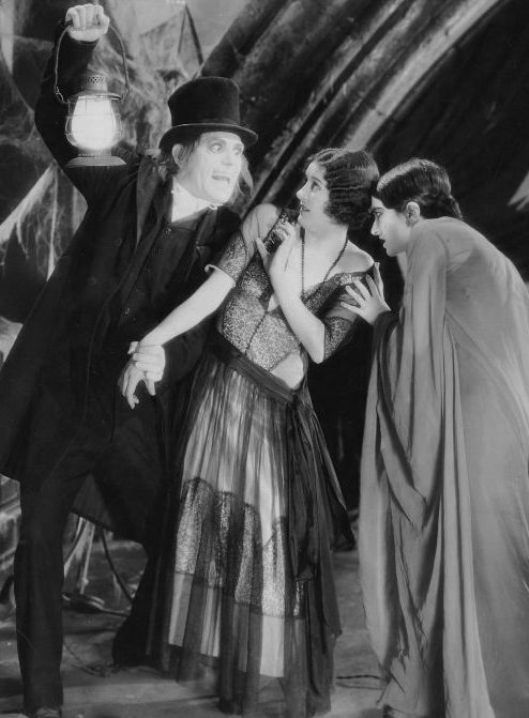 Marceline Day is scared by Lon Chaney and Edna Tichenor in "London After Midnight" (1927), director Tod Browning. Marceline Day and Lon Chaney in "London After Midnight" (1927), director Tod Browning. Marceline Day in a beautiful portrait for "The Gay Deceiver" (1926). A poster for the film "Trent's Last Case" (1929) starring Marceline Day. Marceline Day and Malcolm McGregor under a picture of Lewis Stone - a poster for the film "Freedom of the Press" (1928). 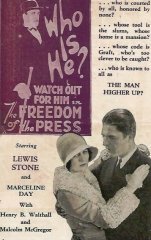 A Spanish language poster for the film "Freedom of the Press" (1928) starring Marceline Day. "Many a young actor has offered himself to play opposite Marceline Day in her newest picture. But none can be found who will promise not to try to violate the consistency of its title, this being "A Single Man"" - a text in Motion Picture Magazine below a full-page picture. Marceline Day in the film "A Single Man" (1929). "Benedicts were ever envious of the estate of the unshackled. But when they see Eddie Nugent thus in "A Single Man" with Marceline Day, they'll go just plain crazy" - a text in Motion Picture Magazine. 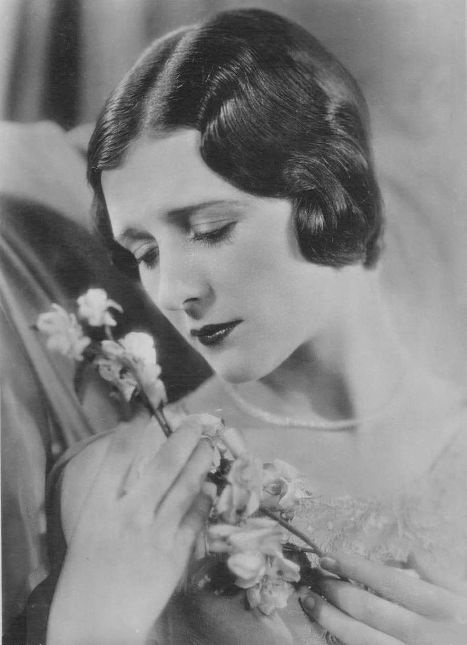 Bloggers have called Marceline Day in this portrait 'A Royal Beauty'. 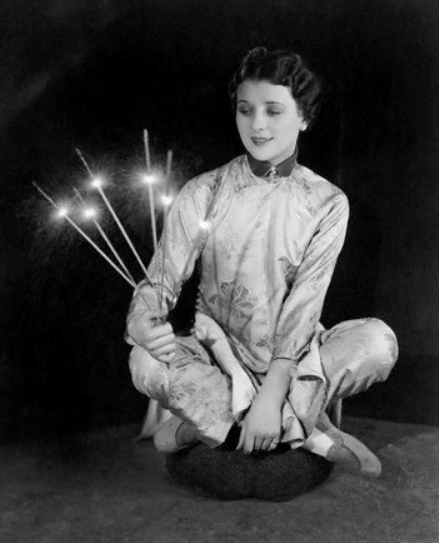 Marceline Day on the Fourth of July. 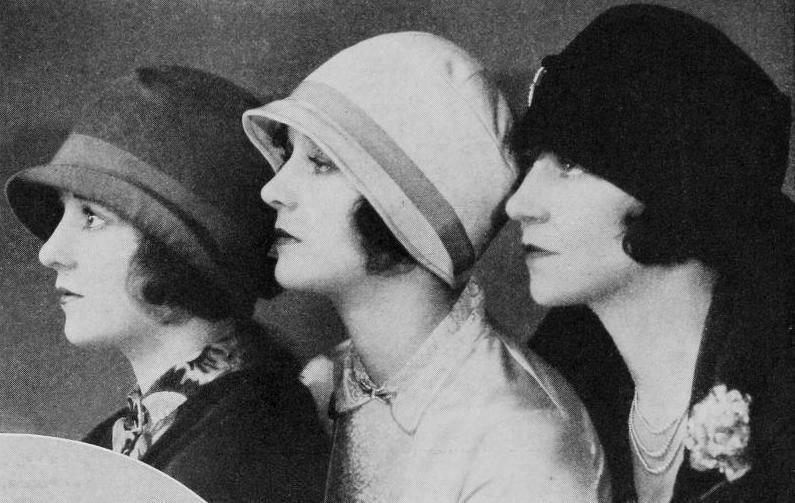 Sister Alice Day, Marceline Day and mom Irene in a beautiful portrait. Marceline Day in a wonderful portrait for "The Splendid Road" (1925), directed by Frank Lloyd. Marceline Day and Robert Frazer in a scene from "The Splendid Road" (1925), directed by Frank Lloyd. 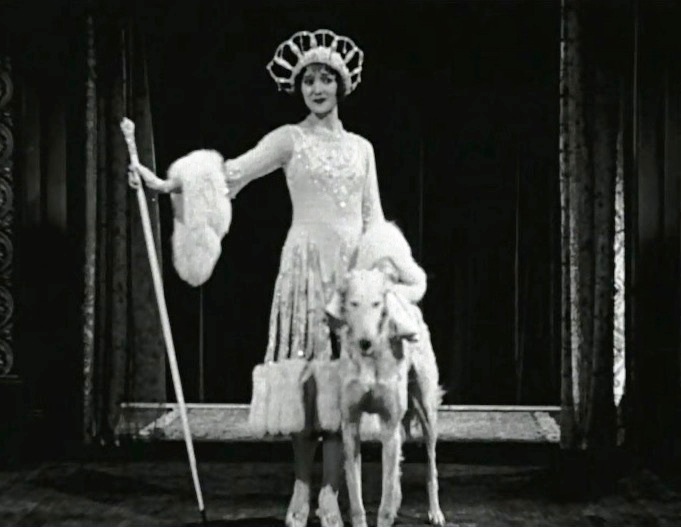 This is a unique photograph of Marceline Day from the film, in which she plays her first dramatic role and where she "creates an outstanding achievement". Marceline Day in a very nice portrait with a flower dress. Marceline Day in an iconic portrait for "The Beloved Rogue" (1927). 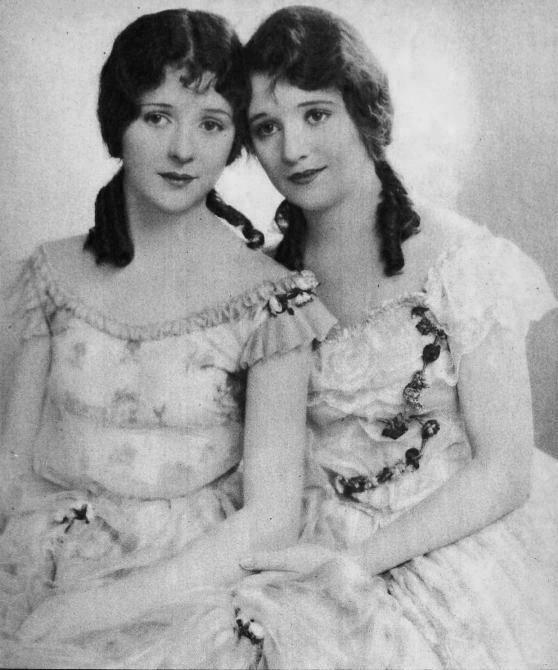 Sister Alice and Marceline Day in 1927. Marceline Day in a splendid portrait from early 1927. 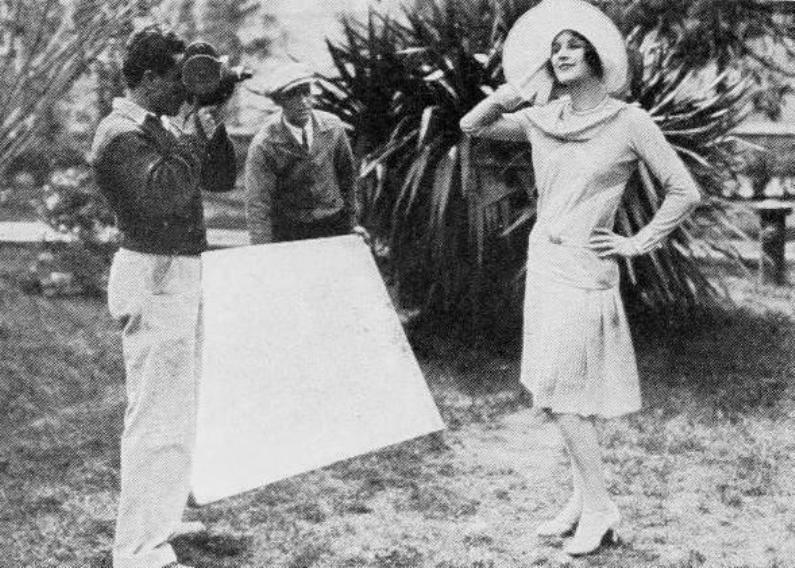 Marceline Day helps cinematographers to experiment with light reflectors. 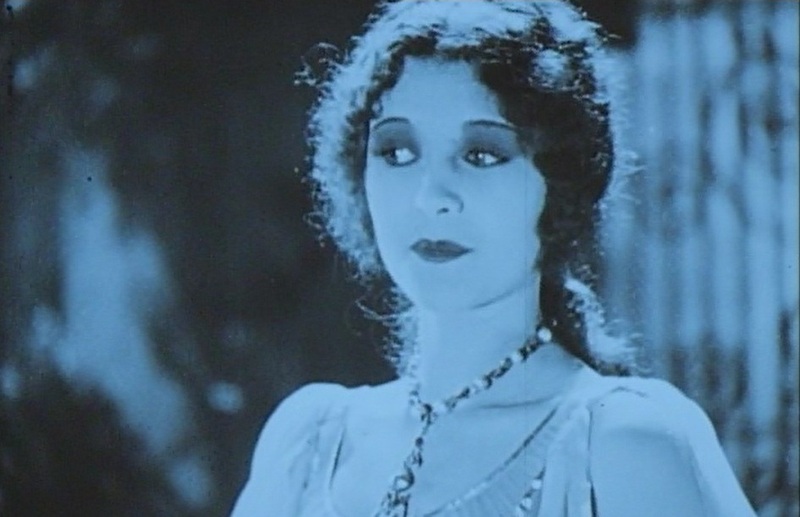 Marceline Day helps again cinematographers to experiment with light reflectors. 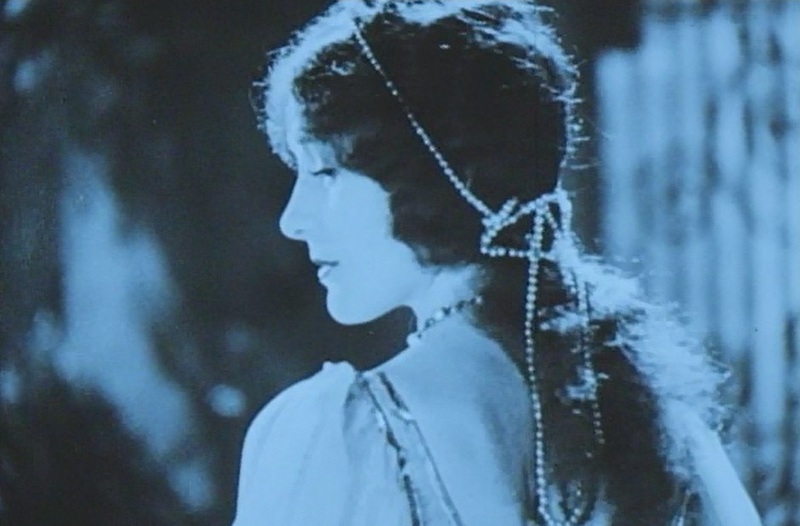 Marceline Day helps cinematographers to experiment with light reflectors one more time. Film Daily, Photoplay, Film Year Book, Motion Picture Classic, Picture Play Magazine, Motion Picture News, Motion Picture Magazine, Motion Picture Almanac, Variety, Moving Picture World, The New York Times, Salt Lake Tribune, Bakersfield Morning Echo, Bridgeport Telegram, Davenport Democrat And Leader, Telegraph, The Canberra Times, Cairns Post, Frankston & Somerville Standard, Advocate - Burnie, Morning Bulletin - Rockhampton, The Advertiser - Adelaide, The Daily News - Perth, Singleton Argus, Mirror- Perth, The Register- Adelaide, Narandera Argus and Riverina Advertiser, Kalgoorlie Miner, Border Watch - Mount Gambier, Sunday Times - Perth, Sunshine Advocate, Examiner - Launceston, Portland Guardian, Southern Argus - Port Elliot, Barrier Miner - Broken Hill, Townsville Daily Bulletin, Werribee Shire Banner, Queensland Figaro - Brisbane, Sunday Mail - Brisbane, The Brisbane Courrier, Geraldton Guardian, The Mercury - Hobart, Northern Argus - Clare, The West Australian - Perth, Camperdown Chronicle, Auckland Star, Evening Post, and many others.